With the rise of apps like Tik-Tok, Musically, Snapchat and Instagram, kids these days are spending more time posting and consuming videos than ever before. The Samsung Galaxy A80 addresses the niche that’s increasingly becoming the mainstream. 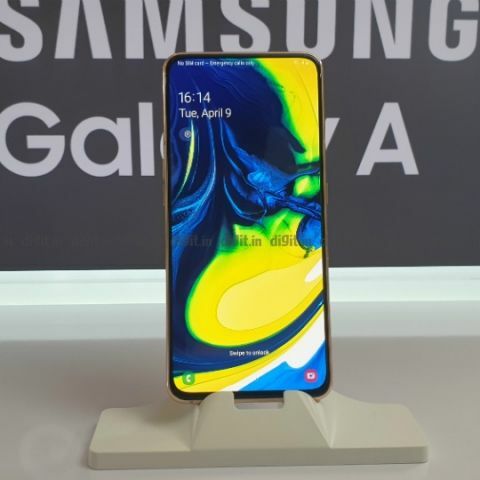 While it’s just been over two months since the Samsung Galaxy S10 launched introducing new Infinity-O displays with punch-hole cameras in the display, the Galaxy A80 becomes the first smartphone in Samsung’s portfolio to include a screen with no interruptions. The Galaxy A80 is Samsung’s first all-screen, nearly bezel-less phone. However, while Vivo and Oppo took everyone by surprise by launching their own versions of all-screen phones with pop-up and slide-out camera designs, Samsung went a step further and made the camera system rotate to become both the front and rear cameras. 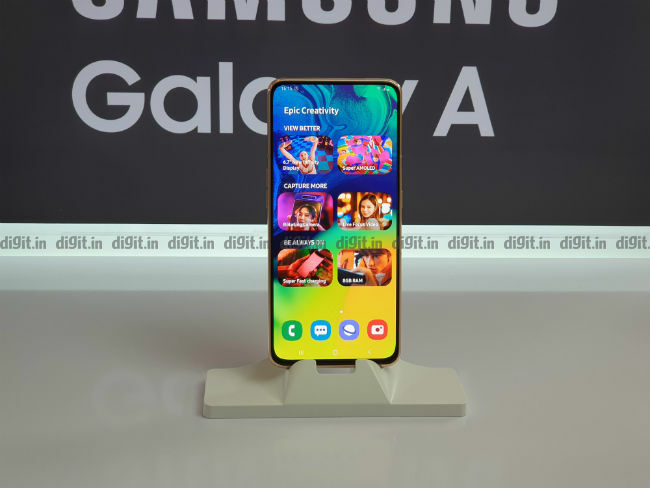 The Korean tech giant was able to address two pain-points with the move — The Galaxy A80 doesn’t have a notch, or punch-hole, or a waterdrop to house a front camera. Secondly, Samsung had to spend less by excluding an extra camera sensor. Front cameras, for some reason, have mostly been inferior in quality to their rear counterpart, but with one swivel motion, that gap was bridged and the necessary attention in this crowded smartphone market, achieved. Samsung didn’t stop there. The rear panel made of glass has a scattered light effect that looks slightly different from the prism-light effect in the Galaxy S10 phones, but premium nonetheless. The edges on the back also curve to give a good grip over a massive display. The Samsung Galaxy A80 sports a massive 6.7-inch Super AMOLED display with FHD+ resolution and 20:9 aspect ratio. Effectively there’s 1080x2400 pixels which looks gloriously bright and vivid. Samsung is no stranger to making excellent displays and the Galaxy A80 is another example of that. The fact that there’s no notch or a hole to deal with sweetens the deal even more. But more than that, this sets a precedent for the next flagship Galaxy device to offer an all-screen design without having to deal with holes and notches. Samsung is also including the ultrasonic fingerprint sensor that debuted in the Galaxy S10 in the Galaxy A80 as well, but the units we used for a while didn’t have the option to configure the fingerprint sensors in the Settings. We were told these are running pre-production software and the final units will have the fingerprint sensors enabled. The screen is much larger than the Galaxy Note 9’s 6.4-inch panel and it’s almost impossible to use the phone one-handed. I’m expecting the display to show more content in one go, and make better use of the extra screen real-estate, but the real treat will come in watching videos on this one. Interestingly, the Galaxy A80 doesn’t have an earpiece and while on call, the sound comes through the display, so you can hold the phone any way you like against your ear and it should work. However, considering the poor sound output in the piezoelectric earpiece Xiaomi used in the Mi Mix, we will have to wait and see how the call quality is. While we will test the display quality out once the device comes into our labs, it’s easy to see the vivid nature of this display and I couldn’t help but appreciate it a lot. It’s not that front cameras on phones have not improved over time, but between the rear and the front camera, the rear cameras have always stayed ahead of the game. The Galaxy A80 levels that field with a camera that doubles up as both the front and the back, and even looks cool doing it. While it’s not the first time a phone uses the rear cameras to take selfies (Vivo Nex Dual Display and the Nubia X offers a second screen on the back for exactly that), Samsung’s approach makes the frame rise up first and the camera system then swivels from the rear to the front. 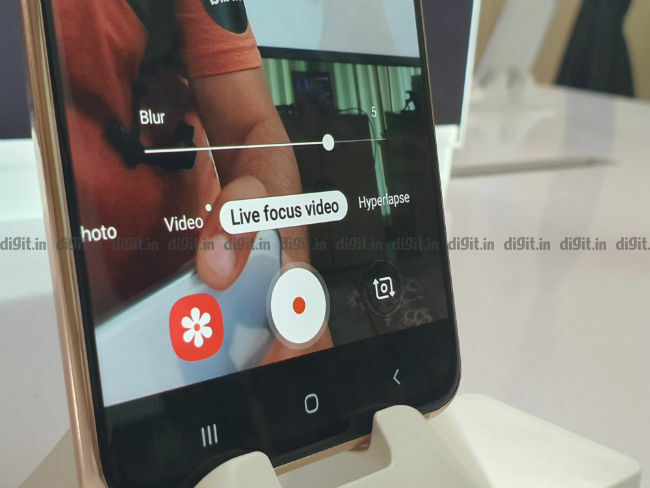 It took around 1.5 seconds for the cameras to rotate though, and when tested against isolated front and rear camera setups, the transition was indeed a little slower. The camera system includes a 48MP sensor with f/2.0 aperture, an 8MP sensor with ultra-wide angle lens with 123-degrees field of view, and a 3D ToF sensor. I was told the units on display were using the Sony IMX586 sensor but Samsung could also use it’s own 48MP sensor in select markets when the device eventually arrives. 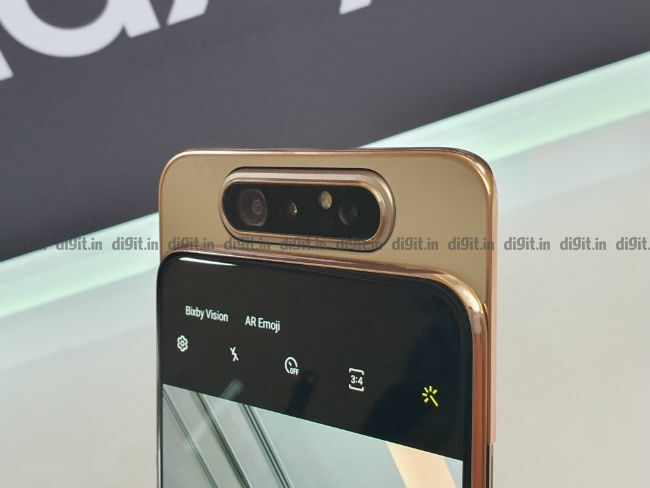 By default, as is the case with all 48MP camera phones in the market, the Galaxy A80 outputs photos in 12MP resolution by binning the pixels, same as the Xiaomi Redmi Note 7 Pro. However, an option in the camera UI quickly enables the 48MP mode. It’s also there in the Pro Mode. For the few shots I managed to take, the Galaxy A80’s camera seemed fine. The ultra-wide angle mode still lacks auto-focus and you can’t use it for macro shots, and there’s usual camera features like Scene Optmiser (which also includes a Night Mode), portrait mode and more. What’s new this time is the ability to take portrait videos. This is one feature that Samsung should hope will draw the post-millennials to this phone. During my hands-on, the feature seemed to work really well, almost seamlessly, without any noticeable flaw in edge detection or blurring. You can set the amount of blur you want, but you won’t be able to edit that later in post-production. The feature became a possibility thanks to the new Qualcomm Snapdragon 730G SoC that ships with a dedicated Computer Vision unit in its ISP. The 3D ToF sensor, for now, is being used to deliver AR Emojis and Bixby Vision. It also helps in auto-focus and the portrait video mode, but other than that, the sensor’s use remains a mystery. Perhaps Samsung can explore things like motion gaming? The Samsung Galaxy A80 sports a brand new Qualcomm Snapdragon chipset that’s tuned towards gameras and creators. The Snapdragon 730G was announced just a day back and it seems Samsung had been working with Qualcomm to debut it just a day after it’s formal announcement. The Snapdragon 730G is the company’s most powerful 7-series SoC yet and features an overclocked Adreno 618 that promises 15 percent faster graphics processing than the standard Snapdragon 730. More than that, the 8nm SoC brings a revamped ISP and AI Engine that enables some of the features in the Galaxy A80 like portrait videos and multi-camera support. The CPU uses the same cores as the Snapdragon 855 and it’s paired with 8GB of RAM and 128GB storage. There’s no expandable storage on this one though. Also missing is the 3.5mm headphone jack which should make creatives wary of the phone. The phone is also quite bulky thanks to a 3,700mAh battery that supports fast charging. 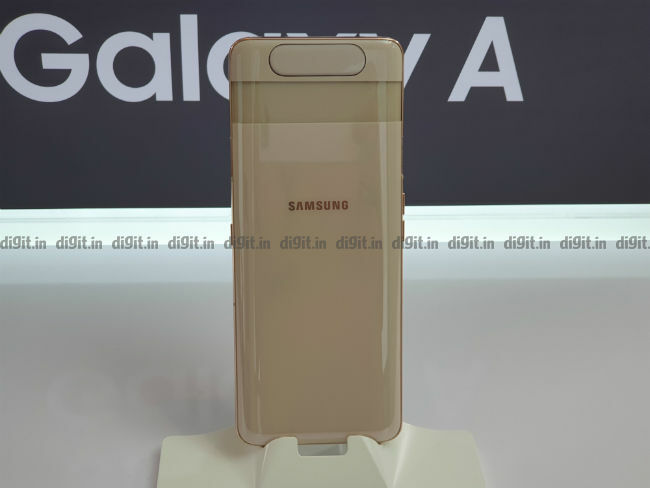 It’s clear that Samsung is using the Galaxy A-series as a test-bed of sorts to experiment with new designs and features, and the Samsung Galaxy A80 is the company’s most radically designed smartphone in a long time. 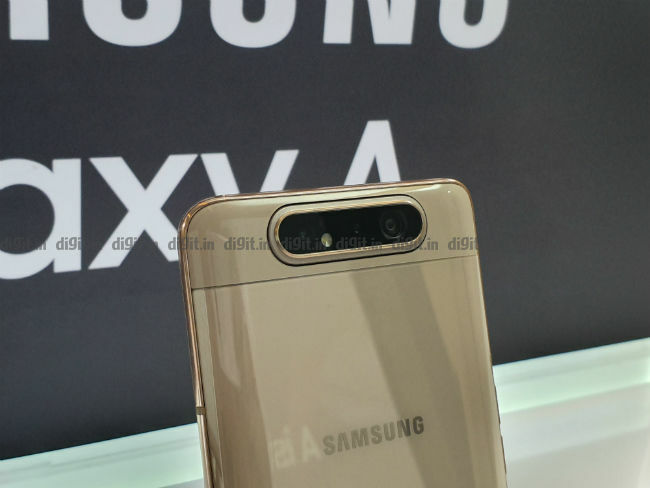 There’s a good chance that if the device becomes successful in the market, these features will be pulled up the food chain to feature in the next flagship Galaxy, and if not, the Galaxy A80 will remain a special device from Samsung, a device that both looks good and has the necessary firepower to perform well. Disclaimer: Samsung paid for th author's travel and stay in Bangkok. What is the price of Samsung Galaxy Alpha ?